Do your kids love fish sticks? 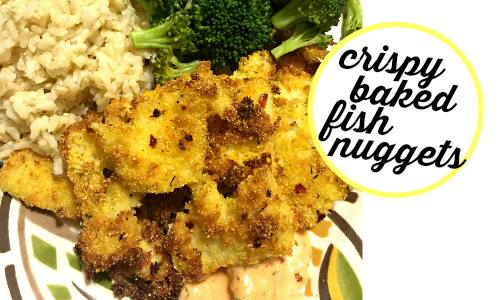 Here’s a recipe that will allow you to make crispy fish at home! 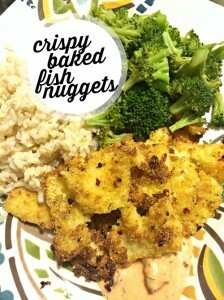 The big plus is that these fish nuggets are baked in the oven and not fried. You’ll likely already have the basic ingredients for this recipe on hand, making your lunch or dinner super quick and easy. In a bowl, beat the egg and stir in the milk. In another bowl, mix together the breadcrumbs, cornmeal, red pepper flakes, paprika, thyme, and salt and pepper. Place the fish pieces in the milk mixture and then dredge the pieces evenly in the breadcrumb mixture. Put the pieces on a baking sheet and bake for 15 minutes or until the outside is golden brown and crispy. Tips: Spray the pieces with cooking oil right before you put them in the oven to help them really crisp up. Also, try to cut your fish into relatively small and thin pieces. The smaller pieces will crisp better than the big pieces.